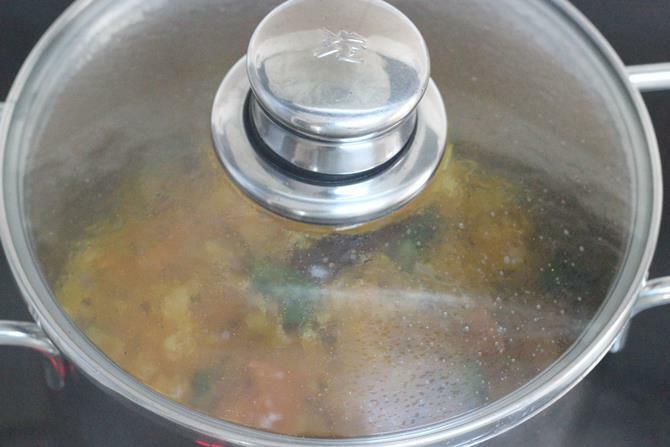 Tomato rasam recipe – Rasam is a daily affair at home for dinner on most weekdays. Rasam, a vegetable stir fry with rice and ghee makes a comforting meal and is easy to prepare as well. 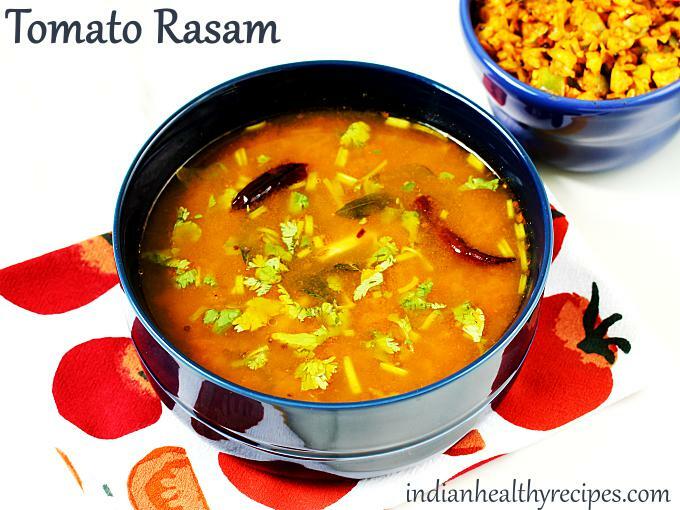 Tomato rasam is light on the stomach and aids in digestion and hydrates the tummy. Hence I prefer to make it quite often. 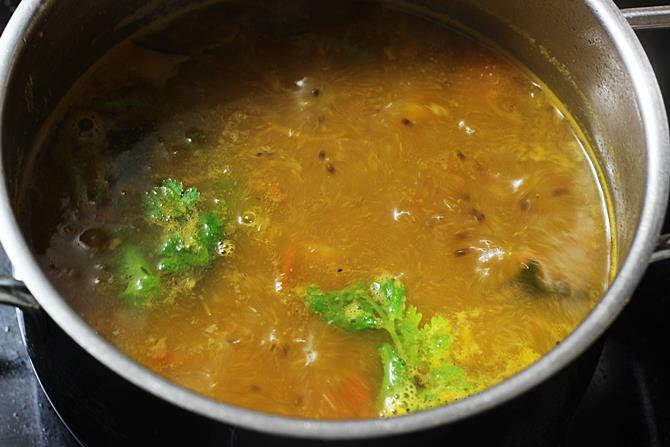 Though there are many varieties of rasam that are made at home. This one is regularly made since it is easy, a good amount of tomatoes are consumed. This south Indian style tomato rasam is named as tomato charu in my mother tongue telugu and is almost the same as tamil nadu style rasam. 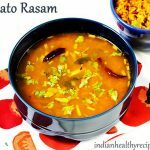 To make this tomato rasam, you can make instant powder that I shared in this post. Any readymade powder or homemade rasam powder can also be used. The color and taste of your charu depends on the kind of powder used. Some of the ingredients are optional and you can skip them. 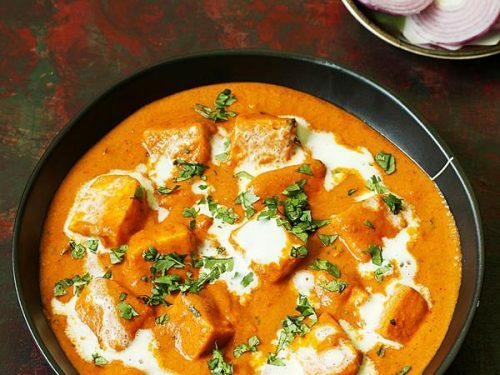 This tomato charu recipe is simple, easy and you can also do your other cooking or kitchen chores while this is simmering. 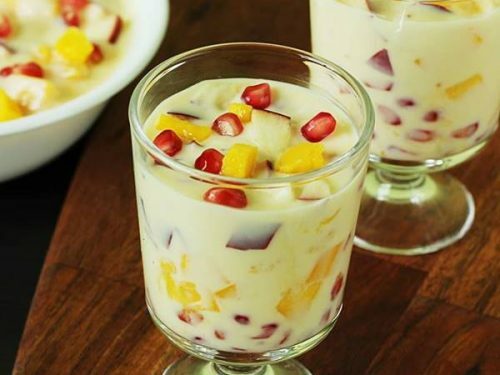 It can also be made in bulk and refrigerated for 2 days. You can also serve this to babies from 8 months, just skip the red chilies and use little pepper powder. You may like to check these tomato recipes. 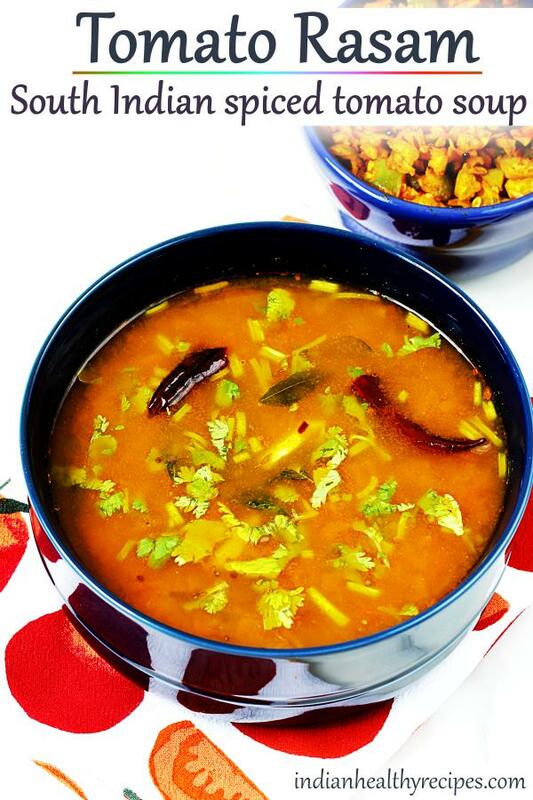 Tangy tomato rasam recipe made with fresh tomatoes, ground spice and herbs. Serve it as a soup or with some rice. Skip this step if you have ready powder. To make instant powder, on a low heat dry roast chana dal (optional) till deep golden. 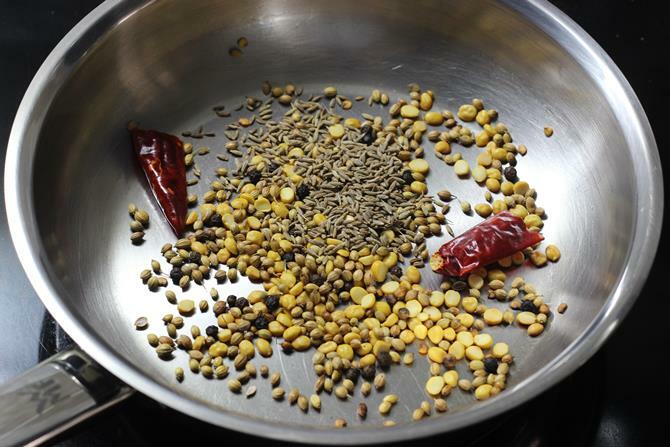 Then add coriander seeds, methi seeds, red chili and pepper corn too. Fry until aromatic. Add cumin to the hot pan and fry till aromatic. Cool them and make a fine powder. Keep this aside. Heat a pot with oil. Add cumin & mustard. When they begin to splutter, add red chili and hing. Add curry leaves and fry for a min. Next add pureed or chopped tomatoes, salt and turmeric. 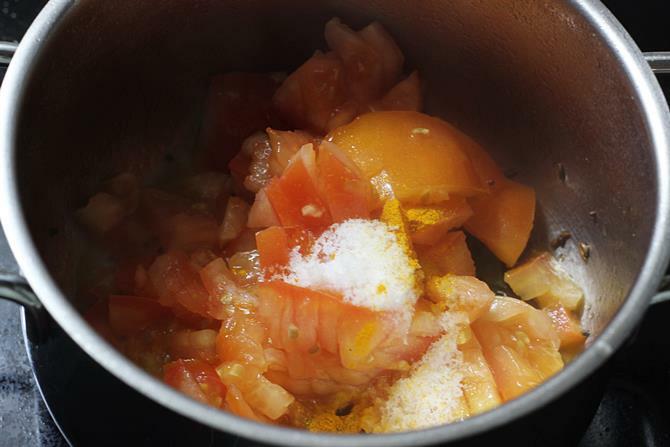 Salt helps to cook tomatoes faster. Fry for about 2 minutes. Cover and cook. Tomatoes should turn mushy and soft. Add the crushed garlic, tamarind, rasam powder and jaggery. Then mix well. Pour water & bring it to a boil. Then simmer for 3 to 5 mins or until thick. 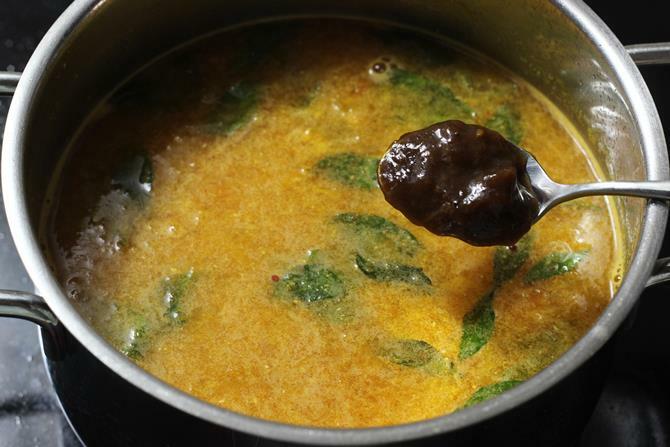 Taste the rasam and add more jaggery, tamarind, salt as needed to suit your taste. I make it sweet, sour and slightly hot. To add more heat sprinkle some crushed pepper. Add coriander leaves and simmer for 1 to 2 mins. Turn off the stove. Keep the pot covered. Serve tomato rasam with rice. 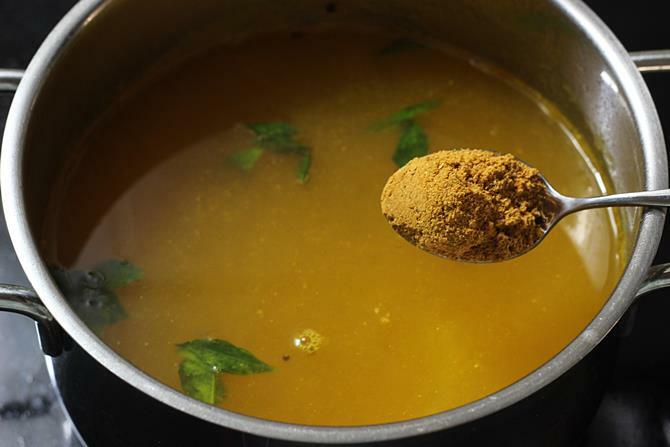 If you do not like the tomato skin in your rasam, it is good to blend them first and use. I do mine most times as my kids love it that way. 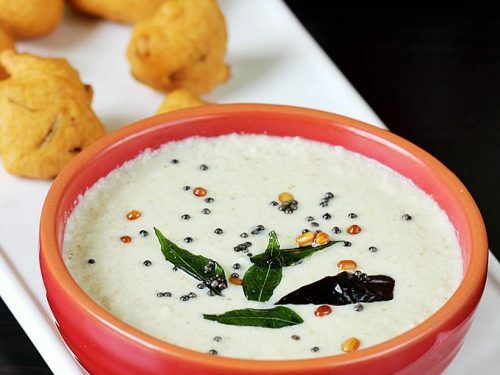 Skip this if you have ready rasam powder. Dry roast dal till golden, add coriander, methi, pepper, red chili. When they begin to smell good and add cumin & fry till aromatic. Cool this and make a fine powder. 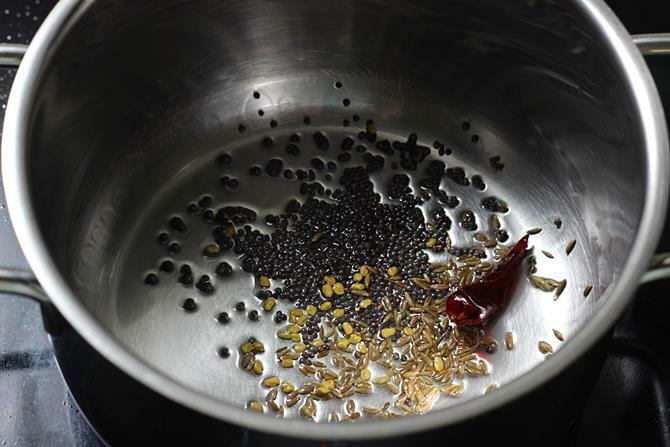 The color of your rasam powder may vary based on the red chili quality or quantity. Firstly wash and chop or puree tomatoes. Update : I puree them most times as my kids do not like the skin of tomatoes in the rasam. Taste wise yes it does make a difference. You can also mash them for quick cooking. Set these aside. 1. Add oil to a hot pot. When the oil turns hot enough, add cumin, mustard and fenugreek. When they crackle add hing and red chili. 2. Next add curry leaves and fry for a minute or two. You can add garlic at any stage. 3. Add tomatoes, salt and turmeric too. Fry for 2 to 3 minutes again. 6. Pour water and add rasam powder too. Adjust more or less as needed. You can also add the powder first and then mix well. Later pour water. 7. Next allow it to boil. You can skip tamarind if your tomatoes are very sour. If using just rinse a small piece of it and add it directly. You can also add tamarind pulp as needed. I sometimes use a bit of jaggery, around 1 tsp grated. 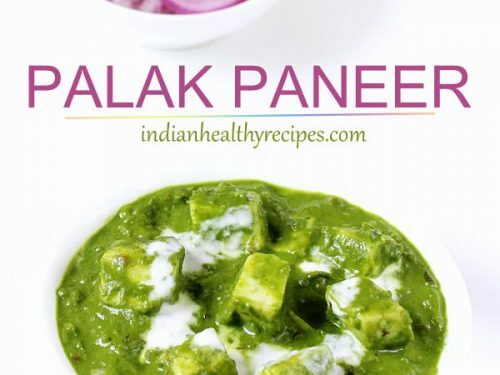 You can also use it to bring down the pungency of other ingredients used. 8. 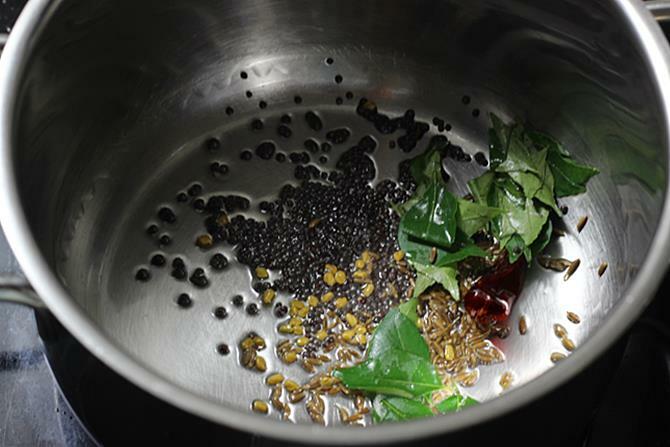 Allow to boil and simmer till the rasam slightly thickens by the powder. Add chopped coriander leaves and pepper powder. Off the stove. 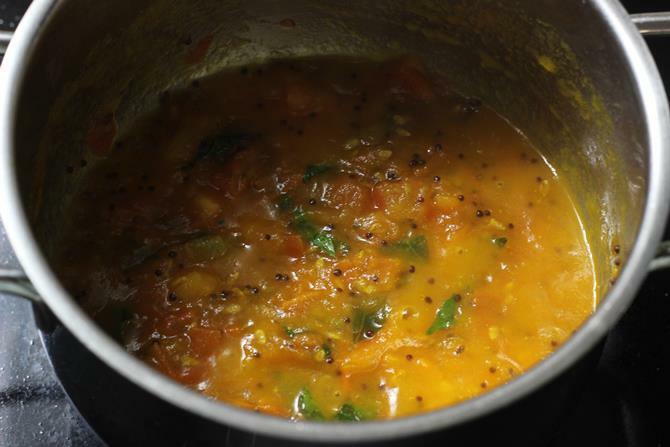 Serve tomato rasam with rice and a simple vegetable or curry. Thank you so much for the comment. Glad to know it turned out good. I tried this rasam for the first time and it turned out very well. Tastes like hotel rasam. And we loved it. Thanks for the receipe. Thanks for trying. Glad you all liked it. 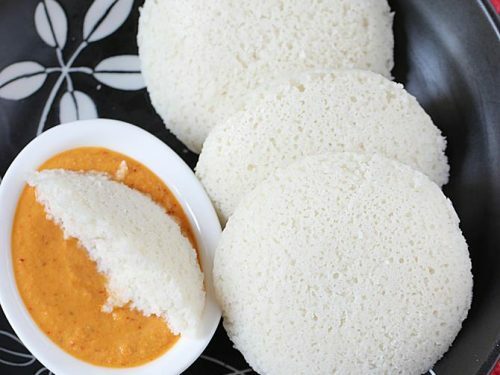 Swasthi, your recipes are incredible. I always reference your recipes for tips and ideas before cooking, and the result is a tasty meal with satisfied tummies! I love that you throw the tomatoes in the blender in this recipe. It made a huge difference, and this was the tastiest (and quickest) rasam recipe I’ve ever made. 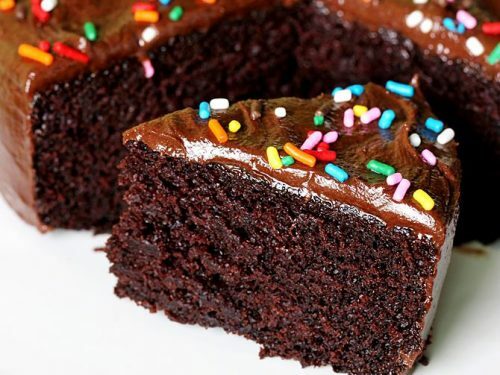 Thank you for posting ALL of these amazing recipes! Your explanations, photos, and layout are clear and thorough. Thank you so much for trying the recipes. Glad to know they are helpful. Yes I do puree the tomatoes most times as my kids are fussy and refuse to eat if they see the skin of tomatoes. Thanks again for the comment. Is the qty of jaggery 1tsp or tbsp? The ingredient list says 1 tbsp and the procedure says tsp. I guess either will do? I love your recipes and always stop here first when i am trying anything new. Thank you!! Thank you so much for following the recipes. Yes either will do. Actually I use more unrefined jaggery and tamarind too to make it slightly sweet, tangy and hot (pepper). My kids love it that way. 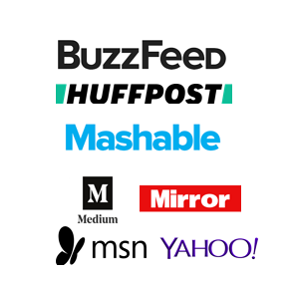 Feel free to add all 3 of them as needed to suit your taste. Thanks again for rating the recipe. Very happy to know the recipes are useful. Thanks a lot for the comment. Best wishes.